Replacing that water guzzling lawn or dramatically reducing the size is a good place to start conserving water and is easier than you think. If you’ve been paralyzed with the thought of digging out and hauling away hundreds of square feet of heavy sod or using dangerous grass-killing chemicals, sheet mulching is the method for you. Mow the lawn down to 1-2”, leave the clippings in place and soak with a hose. Flag the locations of sprinkler heads you will be keeping for your new plantings and cap off the ones you won’t need. Add an inch of compost to speed up the decay of the grass. If your lawn borders a driveway, path or sidewalk you’ll have to remove about 3” inches deep of soil along these edges and back 8-12” so that the new mulch doesn’t slide off into the sidewalk. Put down 2-3 layers of newspaper or one layer of cardboard overlapping the edges by 6-8” to prevent regrowth at the edges. You can buy recycled cardboard in rolls for larger projects or find your own at appliance or bicycle stores. Wet the cardboard or newspapers to keep them in place as you go along. It’s best to use cardboard or newspaper thatwill break down quicker. Don’t use plastic sheeting because water and air cannot penetrate it. Add a 3” layer of mulch such as bark chips from a tree trimming company. You can use compost, straw or shredded plant material. If you have Bermuda grass or other weeds like oxalis you will need to layer about 8” of mulch to smother them. If you can wait a month or more to let the decomposition process get going so much the better. If you just can’t wait you can begin planting now by scraping away the mulch and poking a hole in the cardboard or newspaper where the plant is to go. Then add some compost to help the new plant become established. Be sure to plant high enough to prevent crown rot and keep the mulch a couple inches away from the stem. The top of the root ball should be 1-2” above the soil and just below the mulch. Modify the sprinkler to drip and remember to adjust your irrigation system run times to accommodate your new plantings. This is a basic “lasagna” method for lawn removal. If you are planning to replant with water smart grasses you would choose finer composted mulch instead of bark chips. Either way the process works on the same concept as a compost pile. As the lawn dies from lack of light, it decomposes with the activity of beneficial worms, insects and microorganisms coming up from the soil and doing their job to break down the nitrogen and carbon in the sheet-mulch layers. It’s a win-win situation for the environment and your water bill. Water conservation starts with losing or reducing the thirsty traditional lawn and reducing irrigation. Transform your landscape into a resilient garden that not only saves water but acts to build the earth into a living sponge that harnesses rainwater and replenishes the aquifer at the same time. Attracting wildlife to your new beautiful garden is a bonus. Be sure to apply for your rebates and have your lawn inspected, even if it’s dead, before you start. A groundcover is defined as any plant that grows over an area of ground. They are usually low-growing, spreading plants that help stop weeds from growing and prevent moisture loss. We gardener know that they do so much more in the landscape. Living ground covers add beauty to the garden filling in between plants while holding the soil in place and preventing erosion. They contribute to soil health by encouraging microorganisms. A garden wouldn’t thrive as well without ground covers. With this in mind I encourage many kinds of ground covers in my landscape. It’s a difficult place to find the best ones because of the lack of winter sun and only 5 hours of good summer sun. Still I’ve found a choice one that I’d like to share. It’s tough and reliable in many situations including hot summer gardens. If it will grow in my yard it will surely grow in yours. Kurapia is ta deep rooted, low water use, low maintenance ground cover. It’s parent is in the Lippia genus and has naturalized worldwide. However, Kurapia has been bred to have sterile seeds and its growth habit is much more compact and tamed. Though it is sterile with respect to seed production, it does flower and is bee and butterfly friendly, blooming from May to October. This is a good groundcover if pollination of nearby fruit trees is needed or your want to encourage bees in your garden for general pollination. If bees are an issue for someone in your family Kurapia can be mowed once or twice a month to cut the blooms off. Mowing benefits this groundcover making it grow denser which naturally surpasses weeds once it fills in. Kurapia has been extensively studied at UC Davis and UC Riverside comparing it with No Mow as well as other drought tolerant cool and warm season grasses. Kurapia exceeded them all going 52 days without water and still maintained its green color. An extensive root system that goes as deep as four feet and a dense 2” to 3” tall mat-like top is the secret. The California sod grower recommends more frequent irrigation but it still requires just 60% of the water of a traditional lawn. Kurapia does not require much fertilization either. One time in the spring for growth and flowering and once in the fall to keep the green color through the winter is sufficient. Mine looks great year round and I have to confess I’ve never fertilized it. Kurapia is evergreen and does not have a dormant period though growth stops or slows does in the winter. It spreads and self repairs by stolons. This groundcover grows in sun to partial shade requiring only three hours of sunlight. However it tends to stay more compact in full sun. Kurapia will handle light to moderate foot traffic. It cannot take consistent high traffic though it is very walkable. My dog Sherman finds it great for his morning constitutional and I’ve never seen yellow spots as a traditional lawn will get. Kurapia is hardy to 20 degrees though in tests it has survived temperatures as low as 12 degrees. It’s deep root system is unparalleled for erosion on slopes. Did I mention it takes 60% less water and how much you mow is up to you? Like I said, if it will grow in my garden under less than ideal conditions it will grow in yours. All this talk about “drought tolerant” plants or “water smart” plants is misleading in some ways. What really matters for the success of a plant in your garden is that they are climate smart. You can call the new California garden climate tolerant or climate adapted but it all comes down to the same thing. The plants you choose to grow in your garden should be able to naturally tolerate periods of lower than average water. This doesn’t mean no water during extremely long dry periods. No plant can live without water. I have two books that I look to for plant ideas when called upon to design a garden in our area. This first was published by East Bay MUD in 2004 and is called ‘Plants and Landscapes for Summer-Dry Climates’. The other book I refer to regularly for ideas and information is ‘California Native Plants for the Garden’. Both are invaluable in these times of water conservation. One of the best tips each of them offer is to garden where you live. Philadelphus lewesii near Felton Covered Bridge. All of us live in a summer-dry climate. Summer-dry gardens are naturally dry for long periods. Knowing which type of plant community you live in can make the difference between success and failure in your garden. Choose the right plant for the right place whether it’s a California native from an area with similar soil and exposure or a plant from another Mediterranean-like climate with growing conditions like yours. Plant communities have evolved over time with geologic changes in climate, topography and soils. We have several district areas here- mixed evergreen forest, redwood forest, chaparral and sandhills. If you live in a mixed evergreen forest you garden with trees like coast live oak, tan oak, madrone, bay and buckeye. Understory plants include ceanothus, coffeeberry, hazel and poison oak. Your soil contains serpentine and granite. Many other unthirsty plants like salvias, lavender, santolina, society garlic, giant feather grass, rosemary and rockrose do well here. California natives such as western mock orange (philadelphus lewisii), wild ginger and western sword ferns grow here also. Mixed evergreen forest may also be found along canyon bottoms near streams where big leaf maple, white alder, cottonwood, and western sycamore trees grow. Most plant here grow lush in this deep soil. If you are looking to add something new to your garden here consider giant chain fern, aquilegia, dicentra, Pacific Coast iris and fuchsia-flowering gooseberry. Chaparral areas are the hottest, driest slopes of these mountains. Dense thickets of manzanita, coyote brush, chamise, coffeeberry, ceanothus, monkey flower and sage are native here. These plants are adapted to little water and often have tiny, thick, waxy, light green or grayish leaves. Soils tend to be rocky and shallow with overlaying rock or a subsoil that is mostly clay. Plants here need to have an extensive root system that reaches widely and deeply for water. If you live here a classic combination would be the spring blooming western redbud and Julia Phelps or Dark Star ceanothus. The combination of magenta and electric blue flowers is unforgettable. The sandhills near Quail Hollow and Bonny Doon around Martin Rd. are part of an ancient sandy sea floor that was uplifted, eroded and exposed. These sandy soils lack organic matter and nutrients and their white color magnifies the temperature of the summer sun. Unique, native plants like silverleaf manzanita and Ben Lomond wallflower live here. Buckwheat and sticky monkey flower do well here. You might also try growing Lewisia, a pretty little plant native to northern California, thrives in sand and gravel soils with good drainage. 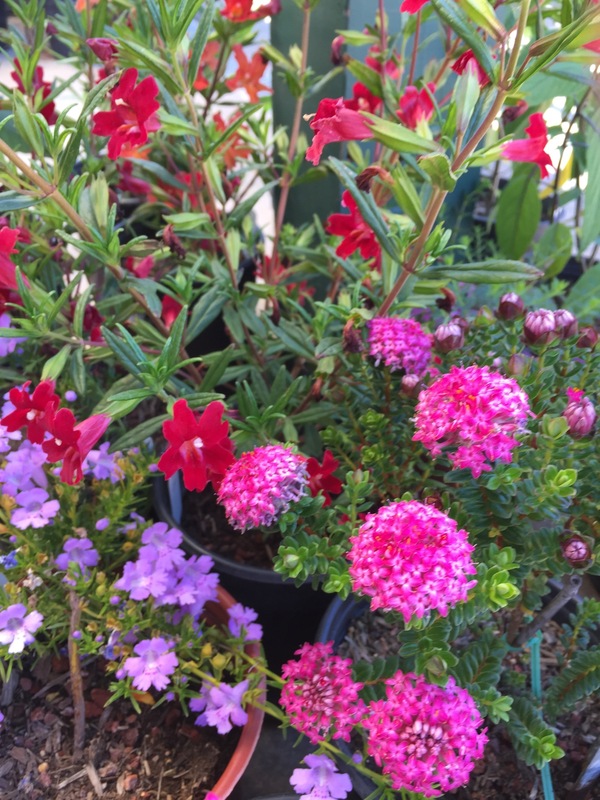 This 8″ tall hardy perennial blooms from spring to early summer with extremely showy flower clusters in colors ranging from apricot to pink, rose and bright cherry red. Mulch them with gravel or crushed stone. Remember right plant-right place. Don’t try to force nature although most gardens do look better with some summer water. Closer to the house we expect a fuller look. Combinations I’m going to try this season include leucospermum paired with blue echium or grey-leafed westringia planted with red-flowering callistemon ‘Little John’. Our local UCSC Arboretum is a place everyone can enjoy. You can marvel at the dozens of jewel-tone hummingbirds darting about feeding on nectar of colorful flowers while strolling the gardens for new plant ideas. 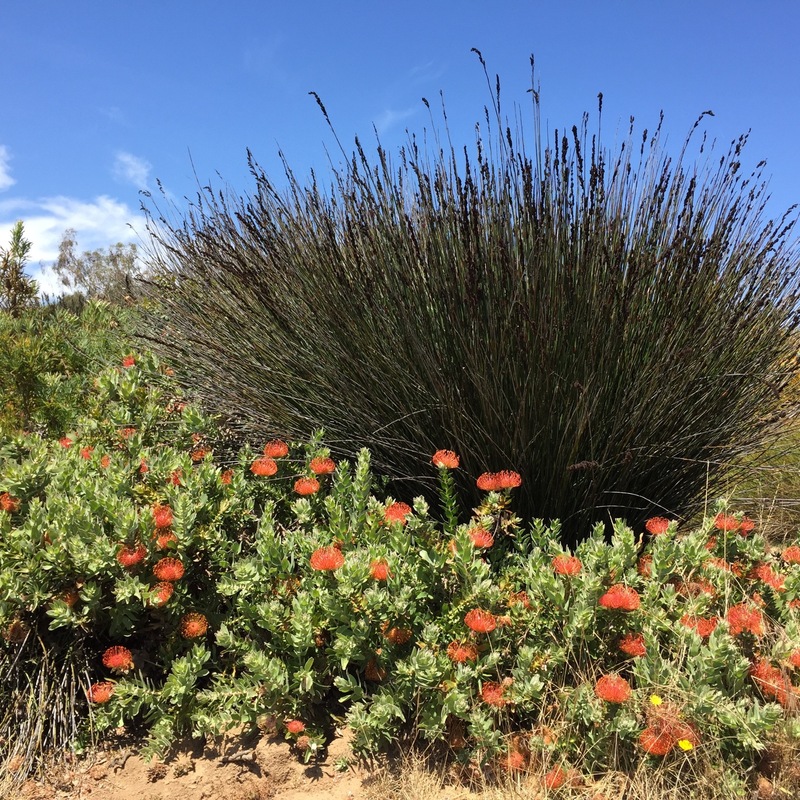 There are still lots of dramatic leucospermum in bloom as well as California native plants that flower mid to late summer. The rainfall last December helped many of the drought tolerant plants grow more foliage and put on a better show this year. The hummingbirds couldn’t get enough of the erica blooming in shades of pink, orange and red. There must have been a dozen darting about feeding and chirping between the shrubs. If you are looking for some inspiration for new low water-use plants you haven’t tried the nursery at the Arboretum has a good selection. They replenish the stock from their growing area on a regular basis so there’s always something to catch your eye. Here are some that I plan to grow myself or recommend to others. Color in the garden is something we all relish. One of the plants that caught my eye is called Hemiandra pungens. Pretty lavender-magenta flower clusters cover this small one foot plant. It’s drought tolerant although it looks better with occasional summer water. Another showy perennial that’s sure to make it’s way into the next appropriate garden I design is Pimelea ferruginea ‘Bon Petite’. Bright pink umbel blossoms cover this small plant for many months starting in the spring. It’s hardy down to 25 degrees and requires little water once established. Also originating in Australia it looks great in a native low water-use cottage garden. The common name for this plant is pink rice flower. The pot in the arboretum nursery happened to be placed near a red mimulus but it looked great even though you might think the color combination would be all wrong. Nature has a way of making things work despite the rules of the color wheel. Several varieties of correa – also called Australian fuchsia – caught my eye. Although the flowers of this plant resemble fuchsias they are not related. Some do best with regular watering during the summer but the lovely correa pulchella ‘Pink Eyre’ is drought tolerant once established. 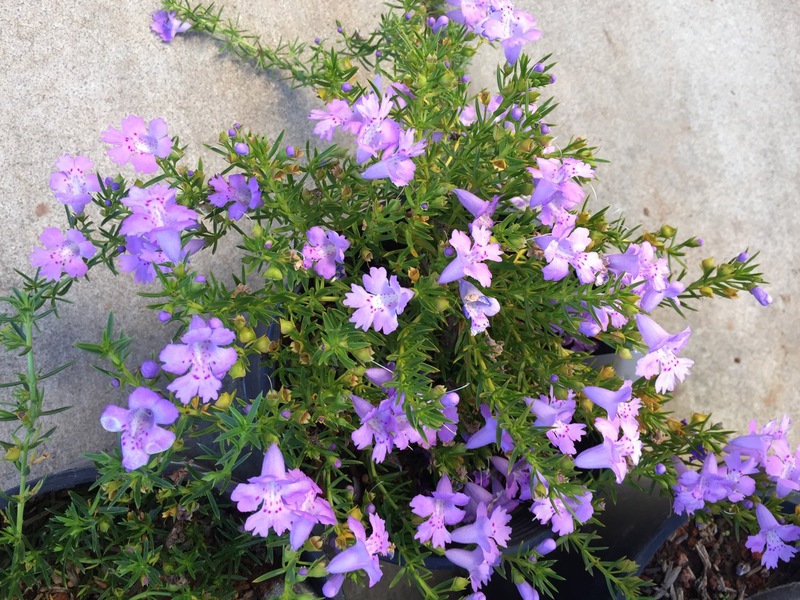 Grow this three foot compact evergreen shrub in partial sun where it will bloom from fall through springtime and provide nectar for hummingbirds during the wintertime. 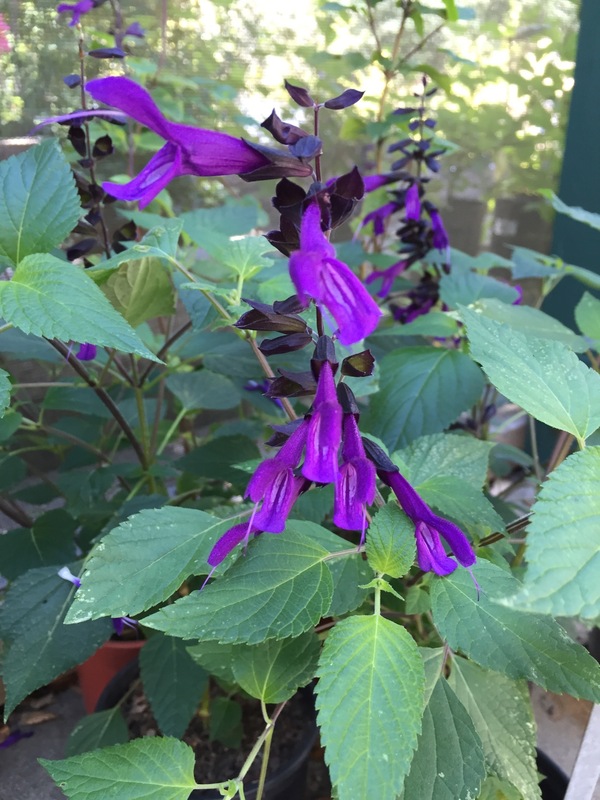 I was also drawn to the brilliant cobalt blue flowers of salvia guarantica. This plant is worth growing – in sun or partial shade – even though you might need to cut it down to ground level after each winter like Mexican bush sage. Growing four to five feet tall it starts blooming in early summer and continues till frost. They also do well in containers and are a favorite of hummingbirds. Prostanthera was well represented with three varieties – ‘Poorinda Bride’, ’Purple Haze’ and my personal favorite, the Variegated Mint Bush. They are all good choices for colorful, easy to grow, hardy shrubs that require only occasional irrigation. Among other choices at the Arboretum nursery were stand-by’s such as lion’s tail, Mexican marigold, Germander sage, Copper Glow New Zealand tea tree and giant buckwheat. This local resource offers a cornucopia of inspiration.